Tullio Bonicelli, in charge of Europe's contributions to the ITER neutral beam heating system, calls them "beyond state-of-the-art components." 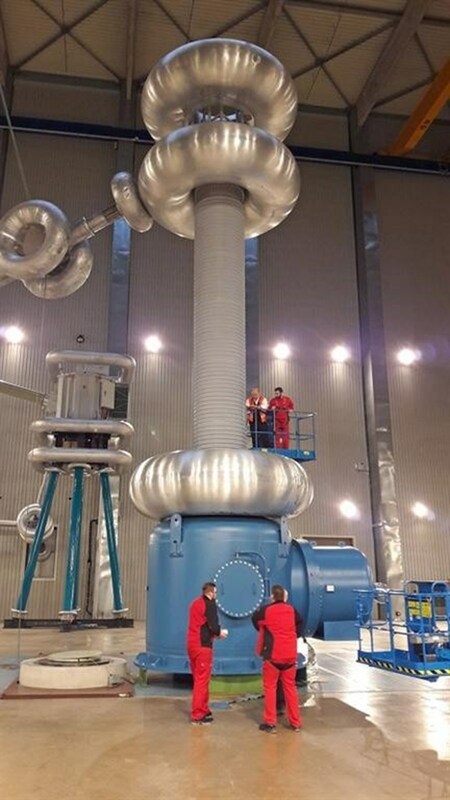 The high voltage deck and bushing assembly for ITER's prototype neutral beam injector have been installed at the Neutral Beam Test Facility* in Padua, Italy. 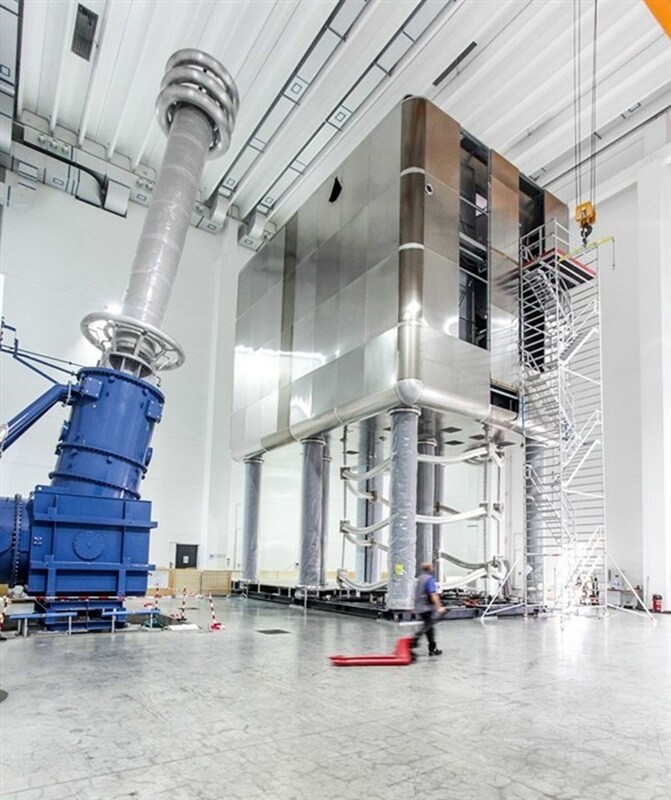 At the test facility for ITER's most powerful heating system, two separate development projects are underway: SPIDER, to characterize the high-energy negative ion source of neutral beam heating, and MITICA, a full-size prototype of the 1 MV beam injectors. In the high-voltage hall of MITICA, two new pieces of equipment have taken their place, not far from components delivered by Japan in November. The first—a two-storey metallic box on eight "legs"—stands more than six metres overhead, and contains transformers, power distribution systems, converters and control cubicles weighing approximately 50 tonnes. The role of the high voltage deck is to isolate the power supplies of the ion source from the ground. Nearby, the high voltage bushing, which will connect the ion source power supplies to the transmission line, stands 12 metres tall. All assembly and testing activities on the equipment have been completed. Three years of collaboration between the European Domestic Agency teams and industrial contractor Siemens were necessary to develop the non-standard equipment, which was not available on the market. "The successful delivery and installation of these 'beyond the state-of-art' components at the MITICA facility paves the way for more tests that will be performed during the second half of the year, after the equipment is connected to the transmission line," according to Tullio Bonicelli, Hhad of the European Domestic Agency's Neutral Beam and Electron Cyclotron, Power Supplies and Sources. "The operation of such extensive system at 1 MV is not only challenging but also unprecedented." Read the full report on the European Domestic Agency website. * The ITER neutral beam test facility (NBTF), also called PRIMA, is a joint international effort to develop the neutral beam injector prototypes for ITER hosted by the Italian fusion laboratory Consorzio RFX. Europe, Japan and India are contributing all components according to the specifications of Procurement Arrangements signed with the ITER Organization; Italy hosts the facility and provides the buildings and a large contribution to the manpower.